Learn how the landscaped was shaped in Shelley. This circuit of just under three miles takes us to the top of a marked sandstone ridge (upon which lies the village of Shelley), and then into the contrasting Shepley Dike Valley below. Although this circuit doesn’t offer an opportunity to see any extensively exposed geology, the undulating landscape can be viewed from on high, and demonstrates an important interaction between mudstone and sandstone sediments. Heading further up the hill the landscape begins to open out. Underlying the surface, sandstones provide a stable platform on which fertile soils have developed from the break down of minerals in the rock, and the addition of decomposed organic matter. In addition to the localised soil (the residual soil), eroded material has been deposited here from wind and from streams over the last 17000 years, blanketing the angular bedrock to give the effect of the rolling countryside. You will come to a stream cutting and meandering through a muddy field. 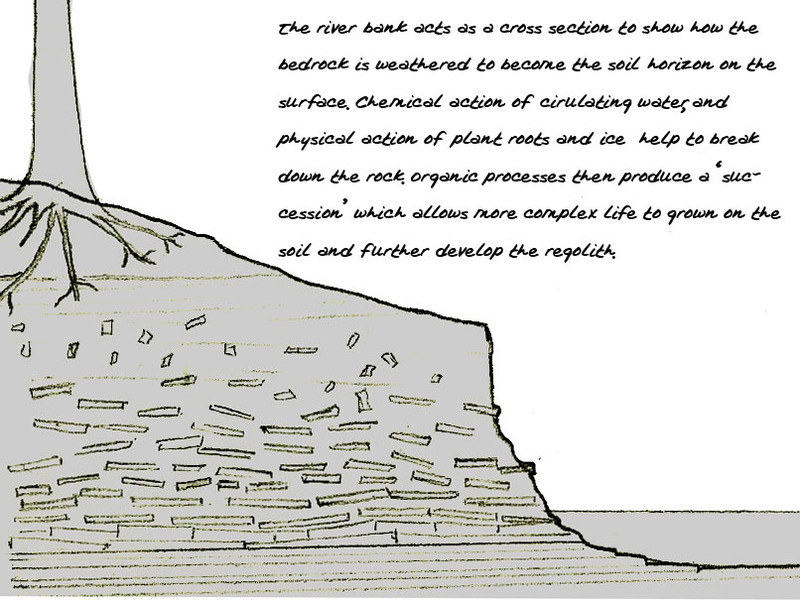 Soil and clay are formed when the bedrock below (in the instance a siltstone) is weathered and disintegrates through the circulation of water, organic action, and chemical decomposition. Furthermore, during the winter, the action of freezing and thawing also increases the rate of weathering. As the river meanders away from the path, you can see a bank that shows a cross section of the soil profile showing this vertical development. Notice that as you get deeper within the ground profile, the clay and soil become less mature, and the transition from silt bedrock, to the clay richregolithcan be seen. Within a few centimetres, small residual fragments of shale can be seen which, as you dig deeper, become larger until the clay and silt fragments are in equal measure. Although it is difficult to define an interface, below this depth we consider the material to be weathered bedrock. Much of the clay produced here will be transported via the river to be deposited elsewhere, providing an important part of the rock sedimentary rock cycle. Descend into the Valley of Shepley Dike to stand on the Greenmoor sandstone, before ascending again onto the Grenoside Sandstone as you turn onto Stretch Gate. When you turn onto Penistone Road from Stretch gate, have a quick look over the wall into the gardens on your left to find (finally!) some exposed rocks. This is actually quite an important exposure, firstly because it shows the top of the Grenoside unit of rocks. We can see there is a series of undulatinglamitnatedstrata that is composed of siltstones. This would have been a highly saturated sediment probably on a river floodplane, and represents the period before thedepositional environmentchanged tobecame a deeper marine environment in which the mudstones above the Grenoside sandstones were deposited. Secondly, there is one of the best examples ofcross beddingthat can be found locally. If you look down the exposure, some of the strata look as though the have been turned at an angle to the other bedding planes. This is an effect of material being deposited in amono-directionalriver current, which would have flowed towards the North-West 310 million years ago. The lines represent the surface onto which material is deposited from the current. After a long time, material builds up to become a series offoresetsthat produce this pattern. The weathering of this exposed surface also emphasises the form of the cross bedding. As you cross Penistone Road you are also cross the Kirkburton fault, which can’t be seen here, but when active caused round 130m of lateral displacement on the surface. Finally, walk back up to the Penistone Flags of Shelley to complete the walk.